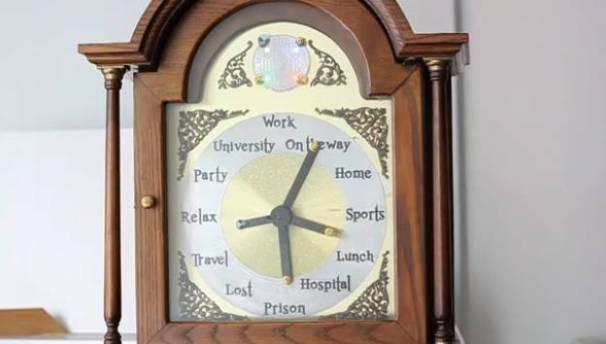 The Magic Clock may be the invention that every parent has been waiting for. Instead of keeping track of time, the Magic Clock keeps track of people. Literally. It has a hand for every person you're keeping tabs on, and shows locations instead of numerals on the clock face. However, before you start plotting how best to snoop on your friends' lives, the Magic Clock will only function if you have the cooperation of the individuals involved. Built around an AtMega8 microcontroller and attached Wi-Fi controller, the Magic Clock requires your friends and family to regularly send updates to its Web server via an app (for iOS and Android) that continually monitors their location. The Android version will send updates to the web server at regular intervals while the iPhone app will deliver updates whenever it registers to a new cell tower. Of course, you can always perform manual updates but that's neither here or now. The niftiest thing about all this? It's an open source project. You can build all of this yourself. The Magic Clock isn't just something you can read about, it's something you can actually add to your living room.